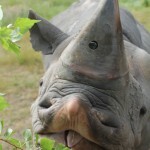 Poachers forced their way into a French zoo and killed a southern white rhinoceros named Vince, sawing off one of his horns before fleeing into the night. The Thoiry Zoo said police are investigating the killing of the 4-year-old animal. The poachers remain at large. Read the full article at NPR!